Above, a two-page photo essay which reflects on some of the ways in which Archbishop Emeritus Buechlein has ministered to people of faith throughout his priesthood. Click for a larger version. March 2 is a special day in the priesthood of Archbishop Emeritus Daniel M. Buechlein. It will mark his 25th anniversary as a bishop. 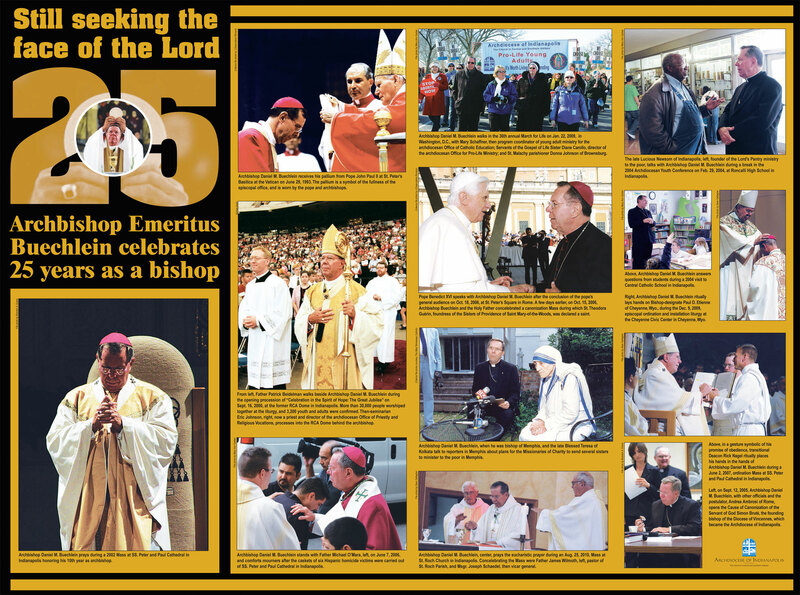 On March 2, 1987, Archbishop Buechlein was ordained and installed as Bishop of Memphis. Five years later, in a homecoming of sorts, he was appointed Archbishop of Indianapolis. He was installed as archbishop here on Sept. 9, 1992. From his commitment to Catholic education to his love of celebrating the sacraments, from the Jubilee 2000 celebration to the canonization of St. Theodora Guérin in 2006 to the 175th anniversary of the archdiocese in 2009, in times of great joy and sorrow, Archbishop Buechlein logged thousands of miles as a shepherd to share his faith and help others seek the face of the Lord—the motto for his episcopal coat of arms taken from Psalm 27 (Ps 27:8).